Buddhas in a variety of sizes, some gold plated, all with painted gold faces. 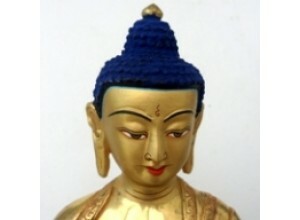 The finest images of the Buddha are produced in Nepal by specially skilled craftsmen trained in family lineages. These artisans make a separate wax model for every image which melts during the copper casting process. The 'lost wax' method results in enhanced detail, life-like expressions and refined finish. Gold powder is used to paint the face and the ornaments are usually gold-plated. We personally select all our statues. 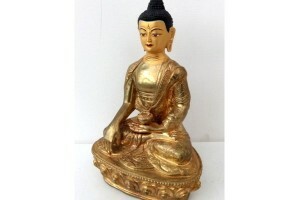 Copper Sakyamuni Buddha, part gold plated. 20cm ta..
Maitreya the future Buddha. 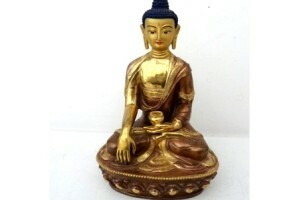 21cm (8 1/2" ) This fi..
32 cm Copper Crowned Buddha with part gold plate. 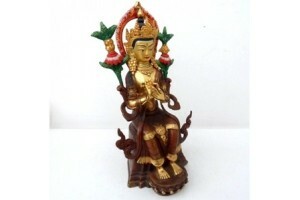 ..
20 cm tall full gold-plated Sakyamuni Buddha with ..